What an exciting few days it has been, that is, if you call almost losing all your work on your website and burning out an oven amidst dinner, exciting. It was quite stressful as I know many of you will understand. The thought of losing all your hard work in the press of one button is simply horrifying. However, I have a very smart nephew on my side and don’t know what I would do without him, especially in the matters of computers. So, thank you Azhar, for dealing with all the tech issues for me. I love you. Even though the main dish was cooked already, this whole burned out oven sure did throw a spanner in the works. I wanted roast potatoes and Yorkshire puddings; how could I make those without an oven? I had to change it up and improvise. One good thing is that we have a combination microwave -convection oven we bought a few years back when I burned out our previous stove. In my defence, it wasn’t my fault, the electronic panel was the culprit. So, this soup recipe, I have been wanting to post this since last week but now you know the chaos that was unfolding in my house. I made this soup last week when we had our fourth winter storm. This one was a biggie. It dumped, in my driveway alone, about 14″ of snow. My garden in the back is still covered with swirls of snow that look like soft serve ice cream. It has been so cold that the snow that fell last week, has not budged and is blanketing most of the State. It is very beautiful albeit a bit messy, especially when driving. One thing about snow falling, just like rain, it puts you in some kind of a lazy trance. Most of the time I just sit looking out of my kitchen doors watching the snow flakes dance merrily down to the ground. You are warm and cosy, and lazy. You want to eat something warm and delicious, but don’t want to spend all day making it. This is why this soup popped into my head. If you like peas, like I do, you will love this. Even my children who aren’t big pea lovers, enjoyed this. 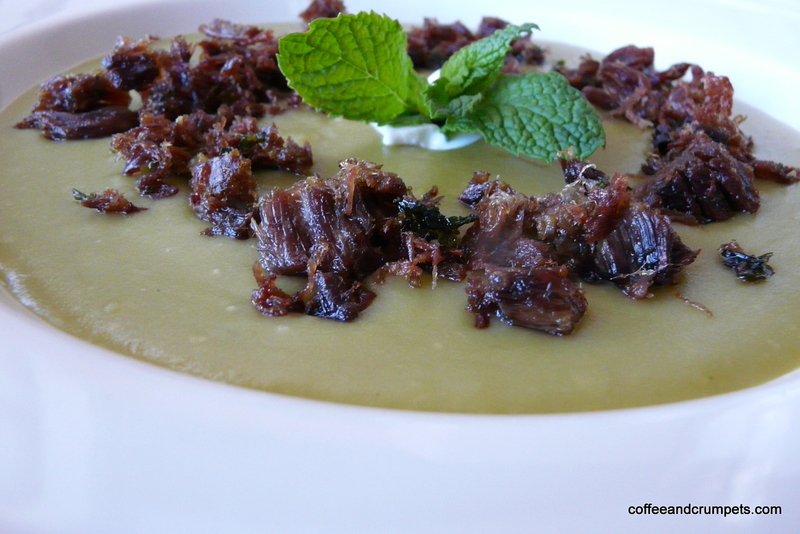 The soup can be purely vegetarian if you leave off the crispy beef shreds. The shreds make a nice crispy contrast to the creaminess of the soup and add a nice flavour too. They are completely optional but since I had some leftover beef shanks from dinner a few nights before, I decided to utilise them. The soup takes seven minutes in the pressure cooker and only thirty/forty minutes on the stove top. A little bit of puréeing and the soup is ready. Spoon out into a bowl, garnish with a dollop of sour cream or crème fraiche or even yoghurt. Add the crispy beef shreds, if using or crispy fried onions, and a sprig of mint. Wash the split green peas and place in the pressure cooker, if using, and add the onions, garlic, bay leaf, a drop of oil, and the broth. Bring up to boil and pressure cook for seven minutes. 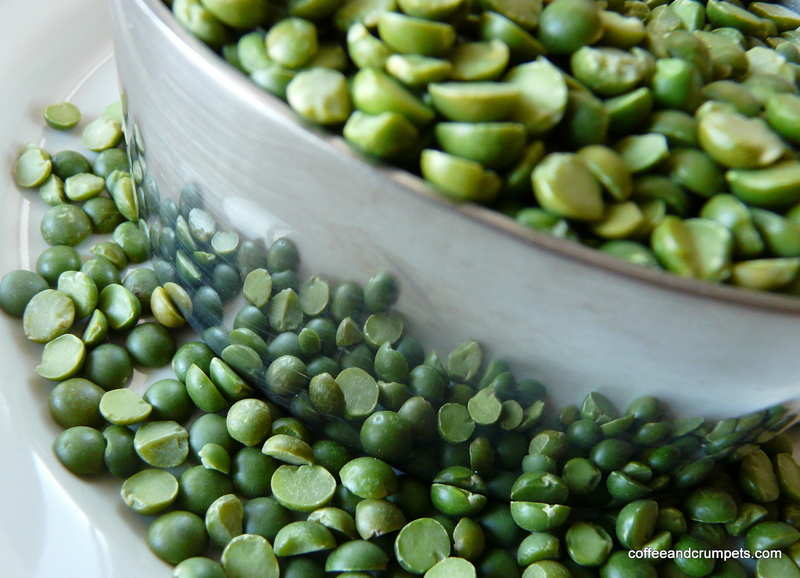 If not using a pressure cooker, simmer the peas in a large pot on low for about thirty minutes or until tender. 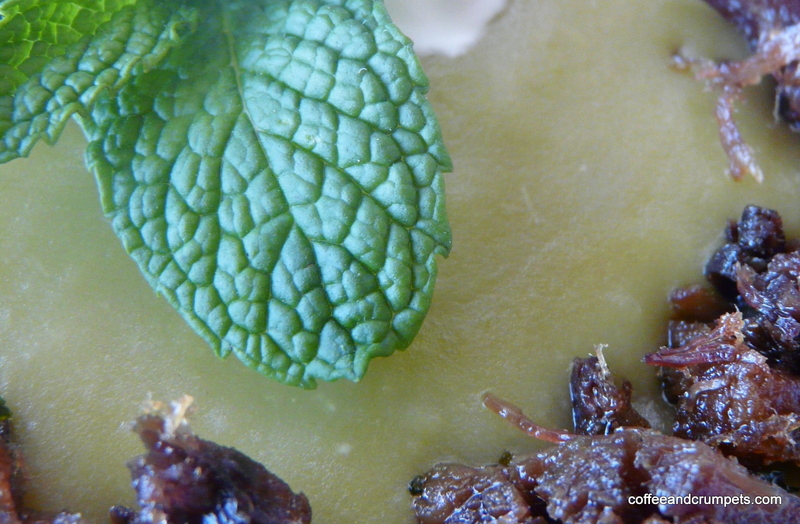 Once the peas are tender, add the mint and warm through. Using a blender purée the soup. Check the consistency and if you want the soup a bit thinner, add some more water or broth. For the beef shreds: take shredded leftover beef and fry in oil till brown and crispy. 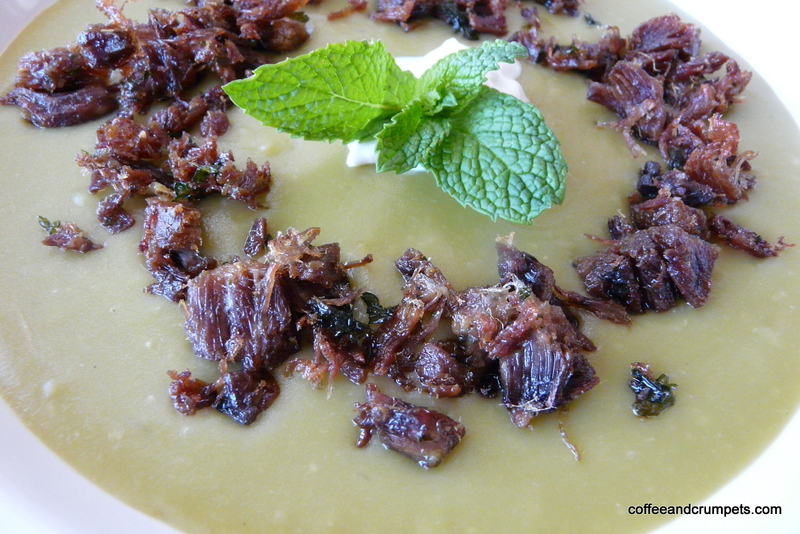 Taste for seasoning and serve garnished with sour cream, beef shreds and a sprig of mint. It is delicious served with some macaroni and cheese or even better, macaroni and grilled cheese sandwiches. YUM! Wishing you all a very Happy 2012!! Thank you for reading and happy holidays! Yummy! I don’t like that all these modern stoves, etc. are so electronic! My stove, when it was only about 7 years old, had a burned out/broken electronic panel. It cost over $500.00 to replace it. Now it’s kind of “squirrely” and makes clicking noises and the light sometimes comes on and goes off. It also doesn’t seem to be as hot as it was before. I would love to find an old fashioned gas stove from the 50’s or thereabouts. Completely manual and No electronics. I should also buy some kind of “extra” oven for at the holidays one seems to need two ovens instead of one! Lucky for you you had one. Me too! I would love an old stove but at the same time, I do love all the new fangled stuff they come up with. I think ideally, I’d like to have one of each. Yes, my convection oven can be a life saver at times, though it is a bit of a beast and takes up a lot of my counter. Hope you had a great Christmas and New Year. split pea/? oi …what? hahaha… let me get pops on this ..
Umm…don’t you know the English pea soup?? Call yourself British..really Auto.